Remember When Communism Was All the Rage? Happy Birthday to the Soviet Union! In 1922, in post-revolutionary Russia, a bunch of commies got together and officially established the Union of Soviet Socialist Republics. 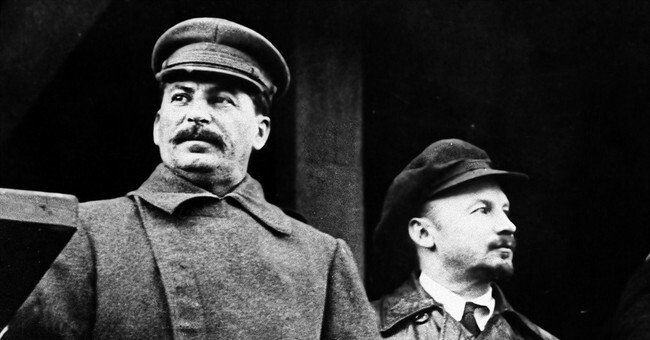 Russia, Belorussia, Ukraine and the Transcaucasian Federation called a meeting, and created the world’s first union based on Marxist Socialism… It shaped up to be such a rousing success, Joseph Stalin celebrated by killing 50 million fellow countrymen. During the Russian Revolution of 1917 the Bolsheviks managed to win over the hearts and minds of their fellow commie forces using their message of Hope and Change; which lead to a pretty clear direction for the country after that pesky Czar (and his family) were out of the picture. Vladimir Lenin dominated the scene, and quickly became the “father” of Soviet style oppression communism. Work, bread, and shelter-for-everyone was the main thrust of Lenin’s communist promises… Sure, no guns, private property, free speech, individual responsibility, or basic access to earned prosperity; but who really needs all that when you have a group of Bolsheviks (living in pretty fancy homes near the Kremlin) telling you how to live your life? In the newly formed worker’s paradise (where everyone labored, but only politicians got rich) all levels of government were controlled by the Communist Party, and the Party’s politburo. Industry was owned not by the proprietors, workers, or managers; but by those altruistic folks who hung out with Joseph, Vlad, and other power-addicted commies in Moscow. (Well… Technically it was owned by “the people”. But, let’s face it: The only guys spending the money were the guys who worked at the Kremlin.) Tellingly, this soon-to-be super power didn’t produce much of value. Their sedans, cigarettes, and radio sets were the envy of no one… In fact, only their vodka and rifles managed to earn much praise abroad. And then, things began to collapse with the fall of the Berlin Wall, and soon the entire union was dissolved as the rotted out core of the Communist Party packed up their bags and decided to forfeit the match. America won the Cold War, free market capitalism had crushed a centrally organized “worker’s paradise”, and basic human freedom had triumphed over oppressive big-government nannyism. On December 30th of 1922, the Soviet Union officially came into existence; bringing with it 69 years of torture, thievery, genocide, murder and oppression. The kleptomaniacal ideology of communism was thrust upon a nation starved for a utopian ideal… And the world has never been the same. Embedded deep within the ideology of Bolshevik communism is the politics of envy; and it might serve us well to remember the destruction such politics inflicted upon the human condition. After all, we really don’t need another 1922 anytime soon.